The Hammers will face Manchester City in next month’s showpiece at Wembley. West Ham and Ireland striker, Leanne Kiernan. 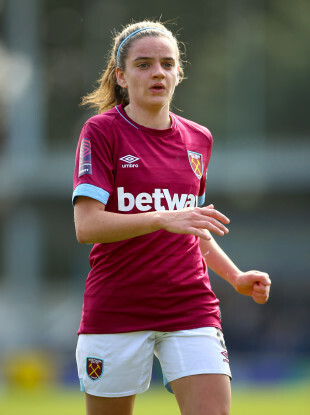 IRISH INTERNATIONAL LEANNE Kiernan will line out at Wembley Stadium on 4 May after West Ham booked their place in the FA Cup final with victory over Reading this afternoon. In their first season as a professional team, the London side saw off the Royals on spotkicks as their match finished 1-1 after extra time. Kiernan started today’s game up front but it was Alisha Lehmann who got West Ham’s goal this afternoon at Adams Park. Rachel Furness gave Reading the lead on 49 minutes. Lauren Bruton was fouled on the halfway line and from the resulting freekick, Jade Moore headed the ball back into the centre of the penalty area. Furness was on hand to nod into the bottom corner and break the deadlock. Lehmann had West Ham on level terms less than 10 minutes later. The Swiss forward made no mistake from the edge of the box to give them a fighting chance just before the hour mark. Reading were left to rue missed chances, none more so than Fara Williams penalty on 70 minutes. The Reading star stepped up to reinstate her side’s lead, but her effort came off the post. The game ticked into extra-time but after an additional 30 minutes, the sides needed penalties to decided a winner. Cho So-hyun scored the decisive spot kick to send West Ham to Wembley on a 4-3 scoreline. “This is so special,” West Ham’s Gilly Flaherty told the BBC after today’s game. “I feel like I could cry. We have a really good group. We’ve had so many doubters and people against us this year – we’ve got here through graft. They will meet Manchester City in next month’s final in London. Megan Campbell was an unused substitute as City ran out 1-0 winners over the Blues. Magdalena Eriksson’s own goal was the difference this afternoon, but Chelsea boss Emma Hayes refused to apportion blame to her defender. “We controlled the game. We were confident throughout. We didn’t get out of second gear most of the time,” she told the BBC. To have lost that way, for a player [Eriksson] who has been outstanding this year, I’m so gutted for her. It’s a cruel way to lose a game. Email “Ireland international Kiernan and West Ham reach FA Cup final in first year as professional team”. Feedback on “Ireland international Kiernan and West Ham reach FA Cup final in first year as professional team”.